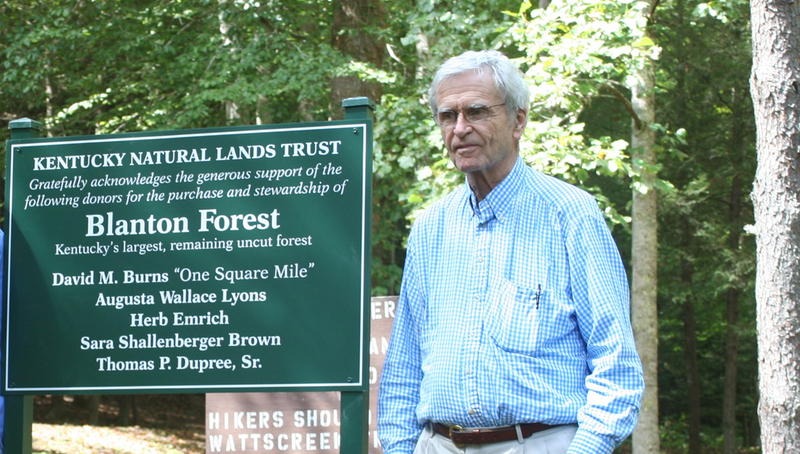 KNLT – Remembering KNLT Co-Founder Tom Dupree, Sr.
Remembering KNLT Co-Founder Tom Dupree, Sr.
Kentucky Natural Lands Trust is celebrating the life of Tom Dupree, Sr., one of Kentucky’s greatest conservation supporters, who passed away last week. Tom Dupree, Sr. was a founding board member of KNLT and supported our efforts to preserve Kentucky’s wildlands for more than two decades. 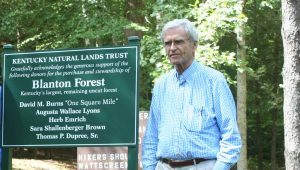 He was an early supporter of KNLT’s partnership with the Kentucky State Nature Preserves Commission to purchase the lands that would become Blanton Forest State Nature Preserve, the home of the Commonwealth’s largest old growth forest and one of the largest state nature preserves. Growing up in Harlan County and spending many days exploring Pine Mountain, Tom had a deep appreciaton for the area and especially for Blanton Forest. He enjoyed sharing stories with our staff about his adventures including his story about the “flying snakes of Knobby Rock.” His early experiences and his love for the outdoors, particularly Pine Mountain, led him to become one of KNLT’s most important long-term benefactors. In 2014, KNLT awarded Tom with our One Square Mile Award, given to those who have made donations that meet the financial level needed to purchase 640 acres. Tom was one of a handful of donors who have met this level of giving. His historic contributions to conservation have also supported projects on the Rockcastle River and preserves established by The Nature Conservancy of Kentucky. Few people have contributed so much to conservation in Kentucky as Tom Dupree, Sr. He will be greatly missed in our conservation community. KNLT hopes to honor Tom by carrying on with the efforts he helped establish many years ago to preserve Kentucky’s unique and remarkable natural areas.